Some of our historic US coin value reports are available for instant download in print-friendly PDF format. You'll get the same value trend data you've grown accustomed to in the online version, ready for easy printing. 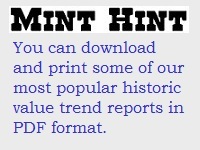 Click on either link to learn how to download printable reports. As an added bonus, we've developed a feature exclusively for the download reports called the Collector Index, which estimates the level of collector interest for a given coin across the full grade spectrum. A high score suggests the coin attracts keen attention within the numismatic community, translating to good potential for solid future value growth; a low score means to expect a comparatively sluggish showing in the coin price guide. D Low Score: In lower grades, contains some degree of numismatic value, but value is largely based on silver content; in higher grades, characterized by plentiful supply and slow price advancements.